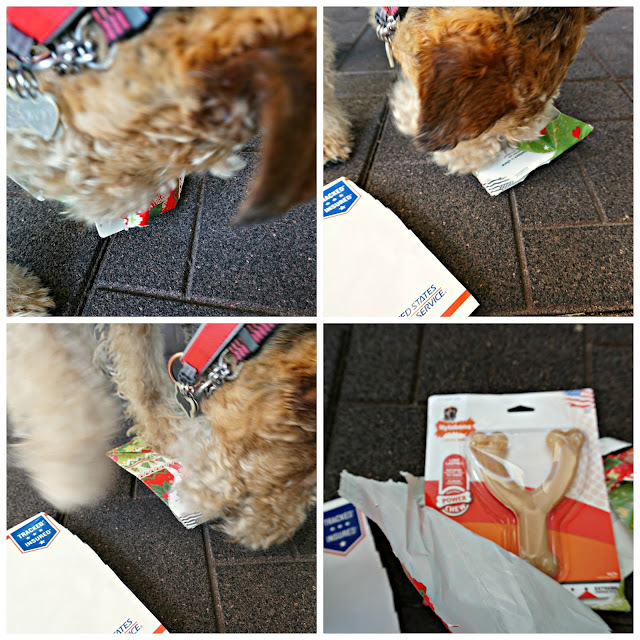 Ruby the Airedale: Pressies from Furiend! Ma FINALLY let me open my Christmas Pressies from our Exchange! Here is the GORGEOUS gurl Millie! I gots to show you all the FABulous pressies she sent! I carefully opened my furst pressie...SCORE! A Nylabone! I loves these! OMD, Millie knows me SO WELL!!! Oh, and a bonus....my bandana doubles as a chewing mat! BOL! Butts, it looks more FABulous on! Okays, gotta go...got work to do! The bandana also triples as a margarita coaster. Ya got sum great pressies, dere, Ruby! Looks like ya got some pawsome pressies - luv dat bandana! 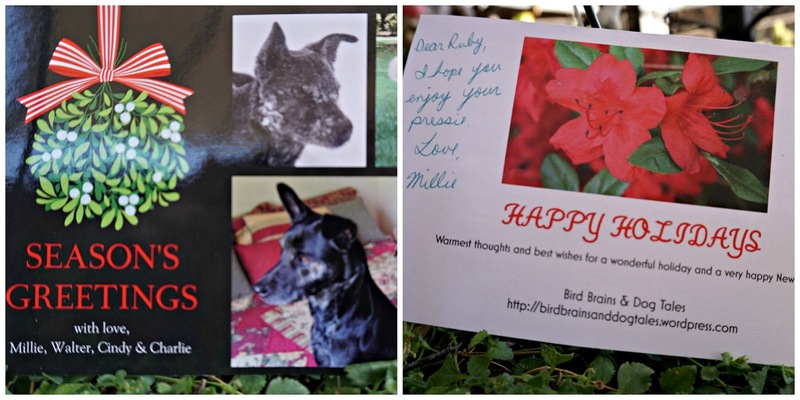 Millie sent you great gifts, Ruby! I love your bandana! Woo Hoo! We're glad you liked your pressies. That bandana looks great on you Ruby and we're glad it fits. Happy squirrel hunting now that you are official. Love it! Squirrels are evil! The treats will give you fuel after all the chasing! Those were some wonderful pressies from Millie and her Mom. We LOVE those nylabones. In fact the three that we have are missing the top of the wishbone:) Mom says she needs to order us some new ones. Great bandanas - and you wear them so beautifully!!! First of all you are fantastic at opening your own presents. We usually sit back and wait for HER to open stuff. LOVE your new OFFICIAL security bandana! Those squirrels better watch out even more. And as for the treats.....sigh! Ruby OMCs that is one fine as wine/margarita scarf. Love the colors and Millie's mom is such a crafty lady. Wow! What great gifts from Millie!!! I LOVE your bandana, and that wrapping paper rocks! Great pressies, Ruby! Cindy has made us some customized bandanas and they are FURBULOUS!! I love your squirrel patrol bandana. Woo Hoo! Awesome Ruby! Love your presses! OMD, that bandanna is pawfect for you Boo! It highlights your fabulous and lovely furs! I am so glad we are passing into the new years in each other's paws! What a pawsome bunch of pressies! Millie and Walter's Mama sure is talented and Millie sure knows how to shop!! What nice gifts from Millie!!! We especially love your bandana! What totally cool and pawsome pressies. You look particularly fetching in your new security uniform!